I’ve been working on a passion project on the side. It’s a book, but not really my book, because the story was written by one of my nephews when he was 10. I loved the story so much (and Ben’s enthusiasm for writing), that I couldn’t let it go. I helped him edit it and refine it into scenes. That was fun and he was such a good student! Then, after many trials and errors, I found an illustrator who captured the right look – so I hired him. It was a long process of back and forth, but his patience (and mine) paid off. The illustrations were adorable and evocative and put a smile on my face. Next came the process of putting those pictures into the form of a readable book, then getting that book up online and waiting for it to go live. Well, it just did. And I am the proudest aunt EVER. (Print is still in process, but it’s coming.) I swear, it’s like I’m a debut author all over again. 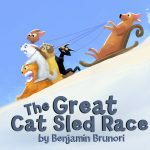 I present to you The Great Cat Sled Race by one of the great loves of my life, Benjamin Brunori. And just in time for Christmas. Just saying.